China Foreign Teacher News, Updates, & Scam Alerts: Scam Alert For China Foreign Teachers - Release Letter Extortions Getting Popular Again! Scam Alert For China Foreign Teachers - Release Letter Extortions Getting Popular Again! When you work in a school in China your details are registered with the authorities. If you leave this school and want to move to another you must obtain a Release Letter from the school. With this, your new employer will be able to register you. Without it, you will not be able to be registered at the new school and - in the eyes of the authorities - will still be working in the first school. The Release Letter is an incredibly important document and you must obtain one. By law the school must give it to you within 30 days from you leaving them, regardless of whether you left them on good or bad terms. The letter needs to be completed and officially stamped by the school. A Release Letter is free and you should not pay for one. However, some schools demand payment for it. Some schools will even include in the contract a clause saying you will need to pay for it and then demand between 5,000 CNY up to 25,000 CNY or about $800 USD (€633, £509) to $4000 USD (€3165, £2545)! But this is totally illegal. You have every right to demand a Release Letter when you leave a school and you do not have to pay a single penny for it. However, if you find yourself in a position where your employer is demanding money for it or delaying giving it, then you should contact the China Foreign Teachers Union who will be able to advise you and help with obtaining your Release Letter from your old employer. 1) Use the "record" feature on your mobile phone and when you approach the principal or HR director and ask for your release letter be sure your phone is in your hand at side and recording. This way you will have solid evidence of extortion if a formal complaint is required. 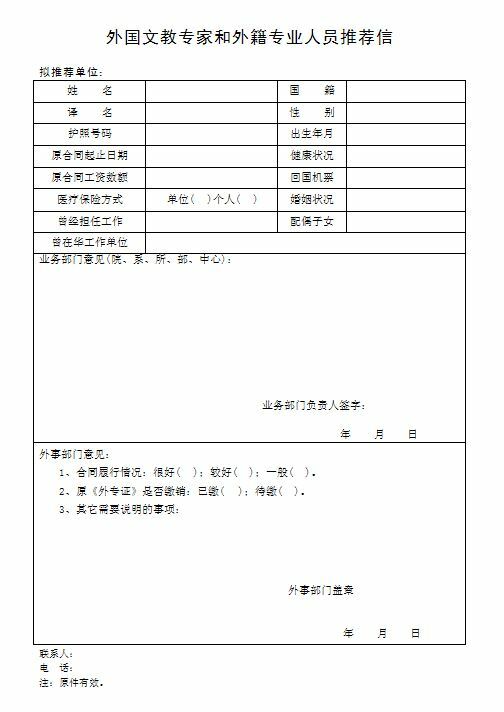 2) Obtain the full Chinese name of the people who ask you to pay money for your release letter (usually on their business cards). If they do not want to give this information, discreetly ask one of the security guards, secretaries or someone else who may have been working there longer than you. 3) Take a close up photo of any and all people who ask you to pay for your release letter. If they fail to follow the law, you will be able to provide an accurate description to the police and Minister of Education as well as post the photo on our web site with a warning to the 6,000+ CFTU members and other ESL/TEFL teachers who visit our website at least once a week. In accordance with Provincial and Central Government law, I am hereby requesting that you provide me with an original hard copy of my release letter that is signed and sealed. I will come to pick it up personally the day after tomorrow at your office. Thank you in advance for your timely cooperation.